Performing spirometry tests could not be easier than with the new Micro Direct alpha touch spirometer. Simply enter the patient’s details on the color touch-screen display, select FVC or VC and begin the test series. Test information is presented in an easy to read format on a clear, bright color display. The best test is automatically selected and built-in quality control checks insure accurate results. Test data along with the diagnostic interpretation and estimated lung age can be instantly printed on the integrated printer, converted to a PDF and printed using the included reports PC software or downloaded to the optional Spirotrac PC Software. The alpha touch features a highly accurate Fleisch pneumotach flow measuring system, battery operated portability and is shipped complete with all necessary accessories in a study carrying case. The easy to use and affordable all-in-one alpha touch spirometer provides a fast, accurate and cost effective spirometry solution. Color high resolution touch-screen display. Fast, quiet internal printer or letter-sized reports via "Reports" PDF software. Real-time F/V or V/T curve. Complete with durable carrying case. Subjects: Name, ID, Age, Height, Gender, Smoking Status, Body Mass Index and more depending on model. Storage of up to 10,000 subjects. Parameters Measured (depending on model): VC, IVC, IC, VT (TV), TLC, RV, IRV, ERV, FRC, FVC, FIVC, FEV1, FEV3, FEV6, FEV1/VC, FEV1/FVC, FEV3/VC, FEV3/FVC, FEV1/FEV6, FEF75, FEF50, FEF25, FEF25-75, FEF25-75/FVC, FIV1, PIF, FIV1/FIVC, FIF25, FIF50, FIF75, FEF50/FIF50, FET, MVVind, FEV1 Ratio, FEV0.5, PEF L/min, PEF L/sec, FEF 0.2-1.2, FEF75-85%, FEF25%, FEF50%, FEF75%, FMFT, FIF25%, FIF50%, FIF75%, PIF, FEV0.75, Lung Age and more. 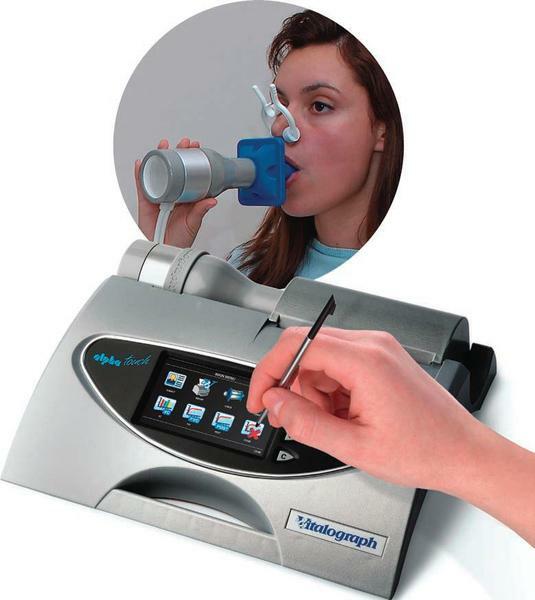 Test Types: Single breath tests, flow/volume loops, multi-breath testing, tidal breathing and combined VC/FVC type test methods supported. Click the button below to add the Micro Direct Alpha Touch Spirometer to your wish list.